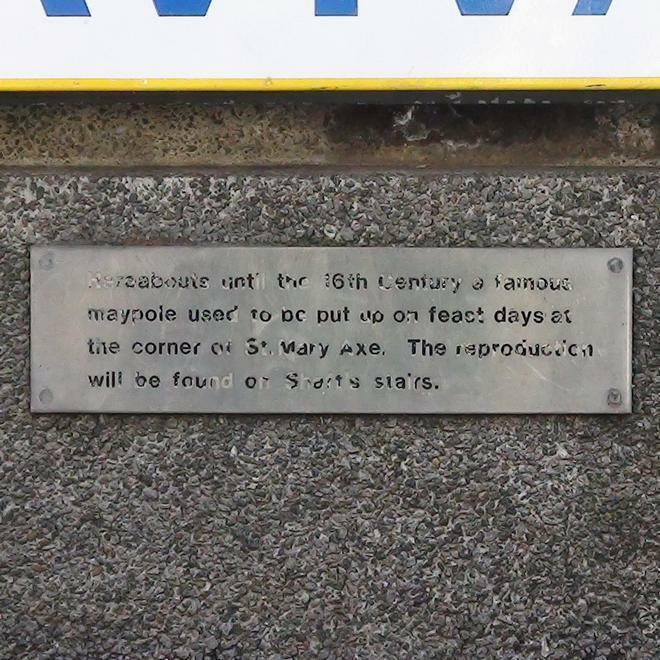 Hereabouts until the 16th Century a famous maypole used to be put up on feast days at the corner of St. Mary Axe. The reproduction will be found on Shaft's Stairs. The only reference we can find to "Shaft's Stairs" concerns a 1970 Civic Trust Award "given to a development bounded by Leadenhall Street, St. Mary Axe, Undershaft and Shaft Stairs comprising the Commercial Union and P&O Buildings, the Podium and Piazza". Most of that has been demolished for the erection of the Cheesegrater so we imagine Shaft's Stairs no longer exist. We found a photo of the reproduction but the site given is currently (2016) a building site, so.... Lost - one maypole shaft - anyone seen it? Not a promising site for a memorial but there it is, attached to the right-hand side of the concrete cube, below "Aviva". This memorial explains the strange name of the nearby street and church - Undershaft.